Not usually known as a world traveler, President George W. Bush has recently been behaving like an itinerant Lonely Planet ghost writer. On November 21, he and his 300-person entourage -- including Ms. Bush and US Secretary of State Condi Rice -- stopped off in Mongolia for four hours on the last leg of an 8-day whirlwind tour through Asia. With the mass protests of early November in Buenos Aires and Seoul still ringing in their ears, it must have been a relief to be greeted in Ulaan Bataar by just thre e well-mannered lonely souls with one placard, urging the US to sign the Kyoto Agreement. The President could also take enormous pride in the fact that he is the very first US President in history to have visited Mongolia -- a land-locked, Alaska-sized grassy flatland with a per capita income below $500 and 2.8 million people, a third of whom herd sheep, live in round huts called "yurts," and dine on endless varieties of mutton stew. No, really. These hyperbolic assertions must have been somewhat perplexing to Mongolia's neighbors, Russia and China. But they no doubt amused and delighted the Mongolians, who gave Bush a thunderous ovation. What was this mutual admiration all about? Does Mongolia really deserve all this praise because it has indeed established a thriving market democracy? Or do the tributes perhaps have more to do with the fact that Mongolia has volunteered for two very difficult assignments -- a prolonged series of neoliberal economic policy experiments, and die-hard duty in the rapidly dwindling "Coalition of the Less-and-Less Willing?" Many of those in the audience must have understood that President Bush's special visit was not only determined by Mongolia's profound contributions to liberal democracy.Bush reminded them that there are still 160 Mongolian soldiers stationed with the Polish battalion in Iraq -- relative to population size, the third largest country contribution to the “Coalition of the Willing.” This is the largest Mongolian contingent in Iraq since the Mongols sacked Baghdad in 1258. Bush also paid a special tribute to two Mongolian soldiers in the audience who had shot and killed a would-be suicide-bomber outside Baghdad this year, preventing him from driving explosives into an army mess hall. With France and Germany AWOL right from the start of the Iraq War, Spain long since buggering out, and other US “allies” like Italy, South Korea, Japan, and the UK now actively debating the withdrawal of their troops next year, this US-spawned effort is threatening to become a “Coalition of One." So it is not surprising that the Empire has finally decided to pay more attention to its most loyal, if distant and geographically insignificant, allies. 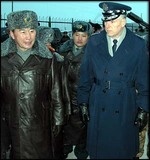 In fact Mongolia has recently been treated to a surfeit of such state visits, including US Defense Secretary Donald Rumsfeld, Joint Chiefs Chairman Richard B. Meyers, and a US Congressional delegation led by House Speaker Dennis Hastert -- who reportedly spent most of his time in the country discussing wrestling moves with his Mongolian counterparts. Mongolians are also aware that providing just a few hundred troops in Iraq and Afghanistan is bringing the country many other rewards. Earlier this year, President Bush announced a new “Solidarity Initiative,” offering financial assistance to Mongolia and other developing countries that ‘are standing with America in the war on terror.’ Under this initiative, Mongolia is already receiving $11 million to improve its military. The United States has recently become Mongolia’s second largest foreign aid donor. Indeed, it will probably soon eclipse Japan as the largest donor – the country has already qualified for aid under the Bush Administration’s new “Millennium Challenge Account (MCA) funding. Although the MCA was ostensibly set up to assist countries that ‘govern justly, invest in their people, and promote economic freedom,’ Mongolia certainly did not hurt its chance by contributing its soldiers to Iraq. On paper, from a distance, Mongolia is a post-communist success story, which has made a rapid recent transformation to democracy and market economy. Indeed, compared with its Central Asian neighbors like Uzbekistan and Tajikistan, it is a virtual Switzerland -- minus the alps, Davos, and private banking, of course. However, Bush’s accolades notwithstanding, the truth is a little more complicated. Most Mongolians are acutely aware that their erstwhile “democracy” is still very far from perfection. 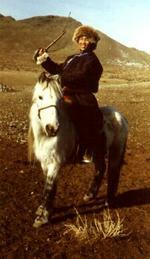 Mongolia was not only the first Asian country to adopt communism – it was also the first to abandon it. When the Soviet Union collapsed in the early 1990s, Mongolia turned to the West for political and financial advice on how to restructure the country. Agencies like the IMF, the World Bank, and the Asian Development Bank insisted that Mongolia follow virtually the same neo-liberal formula of shock therapy and rapid privatization that had just been applied --- with very mixed results -- in Russia and Eastern Europe. These economic policies were coupled with a radical overhaul of the political system, which led to free elections, a liberal constitution, and human rights for all citizens – at least on paper. Fifteen years later, the results of this neoliberal experiment with “market democracy” are now in, and they have been mixed at best. In a recent nation-wide survey, a majority of the population reported that the transition has not improved their lives. By most measures, poverty has increased significantly since communism, with more than a third of the population living on less than two dollars a day. Rapid migration from the country-side has created large pockets of extreme poverty in Ulaan Baatar, the capital, where up to 300,000 people live in Ger (traditional Mongolian felt tents) slums without access to electricity or proper sanitation. Endemic corruption, low trust in the political system, increasing crime rates, collapse of the welfare system, and growing disparities are just a few of the other pressing issues that are threatening to undermine Mongolia’s democratic transition. As in many other developing countries, so-called austerity programs, and the privatization of state assets recommended by multilateral financial institutions like the World Bank and the IMF, have left ordinary Mongolian citizens and the most vulnerable. Nomads and other pastoralists have experienced tremendous hardship during this period. For example, natural disasters (‘dzuds’) in 2000 and 2001 wiped out much of their livestock, and the livelihoods of several thousand families. In the “New Mongolia,” they have no safety net. Meanwhile, vast mining riches have recently been discovered in Mongolia. In principle, this might offered this country a much-needed break, but by most account these new natural resources have actually compounded development issues – as in many other developing countries. Rather than using profits from these resources (record high prices for commodities like copper and gold make this a very lucrative business) on much needed social spending and infrastructure, most of the revenues has gone to foreign mining companies and the tiny elite of Mongolians who often control or influence mine licensing. The Mongolian economy grew by almost 11% last year, yet the lion’s share of this “growth” actually benefited international mining investors and the Mongolian arrivistes who dominate the urban landscape with their brand-new Hummers™ and Land-Cruisers™. The privatization of land and environmental degradation caused by mining is also disturbing Mongolia’s traditional social and demographic patterns, with pastoralists forced to leave what has traditionally been communal areas used for herding livestock. Artisan mining (which takes place illegally in areas that mining companies own but usually do not exploit) has become a way out of poverty for many Mongolians. But the human costs have been huge, with incredible health hazards and little access to public services -- entire families move to mining areas during the warmer seasons, where much of the work is done by child labor. Although no one is longing for a return to the Communist past in Mongolia, there is growing apathy and discontent. Recent protests by pensioners and students show that a political backlash is quite possible, in what is generally seen as a very stable country. The issue is not so much the country’s commitment to democracy in the abstract, but the way the political process actually functions. Neo-liberal policies -- including privatization and the general shrinking of the state -- have proved to be disastrous, with a tiny elite managing to capture most of the political and economic benefits of this transition. Evidence from other developing parts of the world, especially Latin America, tends to show that this elite capture becomes entrenched over time, leading to even greater disparities between rich and poor. Perhaps if Mr. Bush and his entourage had a stayed a few more hours in Mongolia, they might have begun to appreciate some of these troubling realities. They might have begun to understand that ‘democracy’ and ‘counter-terrorism’ have little meaning to most Mongolians, who are struggling harder than ever just to make ends meet. But after four hours of speeches, carefully-scripted receptions, a little mutton and Mongolian beef, and reassurances that Mongolians will continue to fight on in Iraq, they got back on the plane and headed home. **Joachim Nahem is a development specialist for the UN Development Programme and a SubmergingMarkets Contributing Editor, currently based in Ulaan Bataar. All articles for this website, however, are written in his personal capacity and do not in any way represent the views of UNDP.